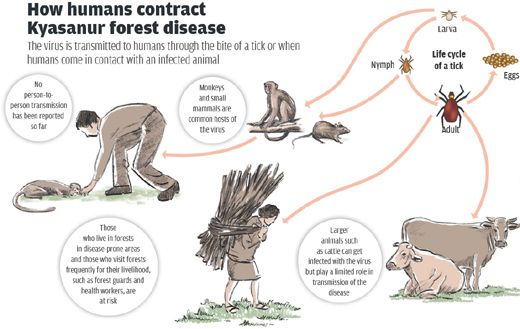 Mangaluru, Jan 18 2019: The Kyasanur Forest Disease (KFD) has spread to Shikaripur Taluk of Shivamogga. It was reported earlier in Sagara, Hosanagar, Sorab and Thirthahalli taluks. KFD vaccination drive has been intensified. The Pune based National Institute of Virology has confirmed that the monkey which died at Ambaragola in Shikaripur was infected with KFD Virus. Meanwhile, five more monkeys were found dead in Udupi District on Thursday. Four of the five dead monkeys were found in Karkala Taluk.